Goal of same or next day service, by phone or office visits. Dr. Hoover was born in Ft Worth, TX. He was in the Eagle Mountain School District through the 6th grade when his family moved as missionaries to the Sierra Madre Mountains of Mexico to serve the Tarahumara Tribe. He returned to Azle for his Senior year of high school, before heading to Texas Tech University. At Tech, he received his bachelor’s degree in Biochemistry. He continued there for his doctorate at the Lubbock and Amarillo branches of the Health Sciences School of Medicine. 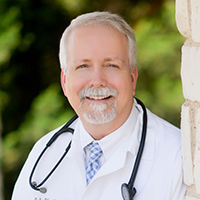 Dr. Hoover has been married for 25 years and is a loving husband, father of two, and active in the Decatur Bible Church. Since 1999, he is honored to serve the Rhome area. His goal is to create a partnership with his patients for exceptional healthcare and guide them toward better physical, mental, and spiritual health. Dr. Hoover maintains his Board status with 50 or more hours of Post Doctorate Medical studies yearly. Rhome Family Practice Clinic is conveniently located in Rhome, TX.